Memcached (pronounced: mem-cash-dee) is a free, high performance, distributed memory object caching system. Memcached can be use for any caching usage but mostly used by dynamic web application to reduce database load. We can also cache API calls and page rendering. This tutorial assumes you have a fresh install of Ubuntu server 16.04. You can also follow this tutorial on any Ubuntu 16.04 flavors. Using Ubuntu server will give minimalist installation of Ubuntu. Let’s update our base system to latest update using command below. That’s it, memcached installed. Now let’s check whether memcached already started and listen to specific port. Run netstat and find memcached process. We can also use ss as replacement of netstat to check where memcached listen. We can check memcached service status by running command below. This is sysv compatible service command. Oct 09 02:24:57 ubuntu-xenial systemd: Started memcached daemon. Since Ubuntu 16.04 already use systemd, we can also systemctl command to check memcached service status. Now we have memcached running let’s learn how to configure memcached. Memcached comes with two configuration files. Now let’s check /etc/memcached.conf configuration file. This doesn’t mean you cannot see memcached logs. The logs will be captured by systemd and we can use journalctl to see the log. By default memcached will use 64 MB of memory. Memcached doesn’t reserve the memory on start but the memory usage will grow as needed with the limit as specified in -m option. We can configure memcached port using -p option. By default memcached use port 11211. If you change this port to non default you need to configure your application to also pointing to the same port. This options is to configure which user run memcached process. We will rarely need to change this. By default memcached will listen on all network interfaces. We can configure on which address memcached listen to. Please note that this is the only security mechanism that memcached have. If you plan to open your memcached server from another server ensure you add firewall to the memcached server. If you use cloud service like Amazon Web Services you can use security groups. If you use provider that doesn’t offer firewall or you install on your own infrastructure you can use iptables. We can limit connection using -c option. The default value is 1024 connections. 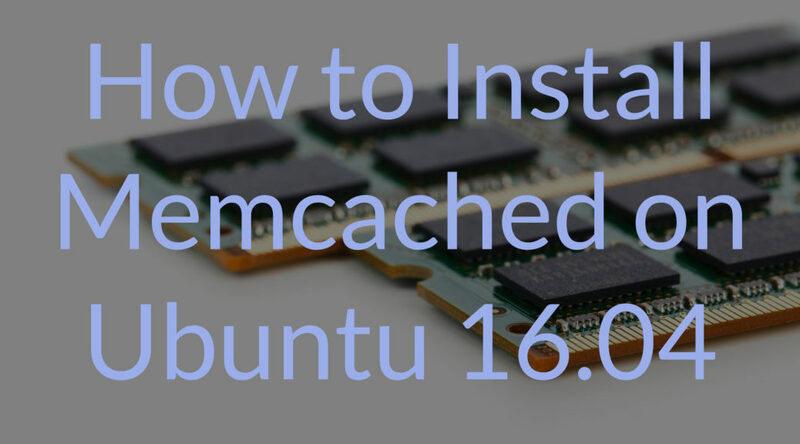 In this tutorial we learned how to install memcached on Ubuntu 16.04. We also learn how to do basic configuration of memcached. I hope this tutorial is useful to help you installing and configuring memcached. Introducing cache on your stack can improve the performance of your web application. Until next time.